The 100th anniversary of “SHARQAT DAY” is being celebrated by The MARATHA Light Infantry Regimental Centre on 29 and 30 Oct 2018 with grandeur. “SHARQAT DAY” is celebrated every year to commemorate the gallant victory of 114 MAHRATTAS (now the Regimental Centre) at Sharqat (now in Iraq) on 29 Oct 1918 during First World War. The significance of Sharqat Battle assumes the greatest importance since this victory led the culmination of World War I. Post Sharqat Battle the Ottoman Empire surrendered to the Allied Powers marking the end of Great War. In recognition of their gallant victory, 114 MAHRATTAS was awarded the Battle Honour “Sharqat” where it earned laurels being conferred with 28 gallantry awards and 8 Mention-in-Despatches. 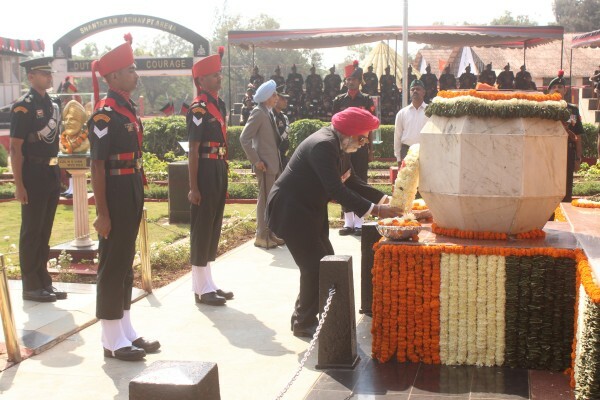 The Centenary of Battle of Sharqat being held this year is a momentous occasion for the Maratha Light infantry Regimental Centre since Gen Bipin Rawat, UYSM, AVSM, SM, VSM, ADC, Chief of Army Staff and also Royal families of Kolhapur and Kurandwad would be presiding over the events to be held on 30 Oct 2018. The highlight amongst the various functions held was paying homage to the martyrs of the 114 Mahrattas who sacrificed their lives on this day by laying wreaths at War Memorial by Lt Gen PJS Pannu, PVSM, AVSM, VSM Colonel of the Maratha LI regiment and by Honorary Col of the Regiment Gen JJ Singh, PVSM, AVSM, VSM, ADC (Retd). A grand cultural programme is being organized on 30 Oct 2018 at Keshav Rao Talekar Drill square by the Regimental centre recruits which would showcase few snippets of the Sharqat battle as also traditional folk and martial events of Malkhamb, Lezim, Jhanj and PT display would add colour to the gala evening.